Red Valve Series 40 Pressure Sensors are the industry standards for protecting instrumentation, and assuring accurate, dependable pressure measurement of slurry and corrosive fluids. The line pressure is sensed 360° through the flexible rubber sleeve. The captive fluid is displaced through the pressure sensor body to the instrument’s Bourdon tube. All instruments are isolated and protected from the process, assuring positive and accurate readings. The Full-faced, thru-bolted Series 40 installs directly in-line, Costly installation and maintenance of pipe stands and saddle welds, which are required when installing antiquated diaphragm seals, are eliminated. The thru-bolted Series 40 can be mounted in any flow direction, submerged in a tank, or mounted with a blind flange as a dead end to monitor tank levels. The Red Valve standard gauge is bottom mounted, with a 2½” diameter steel case; accuracy of this gauge is ±1% of the gauge reading. A 0-100 psi gauge is furnished as standard unless otherwise specified. 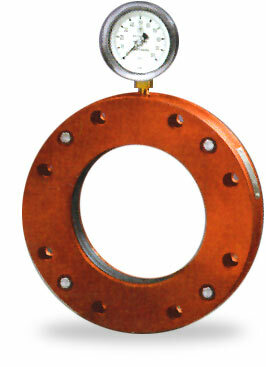 0-200 psi gauges are optional at no additional cost. As Red Valve Pressure Sensors and gauges are tested and calibrated through the mid-range to assure the highest level of accuracy. Pressure gauges, transmitters, transducers, recorders, differential pressure or vacuum switches are factory filled and mounted to the Series 40.